Buckle up, since there are some scenarios for the Govs (8-7-1, 3-5-1 OVC) as well as the Redhawks (4-8-3, 2-4-3 OVC) to qualify for the tournament. After games on Thursday and Friday, the Govs have seen themselves move from seventh to ninth place in the OVC, all without playing an opponent. Third through tenth place in the conference are only separated by an insane four points, meaning it is basically eight teams vying for six spots. A win would guarantee the Austin Peay State University Govs a place in the OVC Tournament. The Govs (10 points) would jump one of Tennessee Tech (11 points) or Eastern Illinois (12 points) since those two teams play each other and there is no result that has both teams on at least 13 points if the Govs win. If the Govs draw, they have to rely on other results and tiebreakers. A Govs loss and they would miss out on the tournament. By our calculations, the Austin Peay State University Govs can finish no higher than fifth. The Govs need a big-time result on the road as well, as they have not won a road conference match since September of 2016 (4-3 win over UT Martin). A win would exercise the road demons that have haunted the Govs recently. Something that could help the Govs against the Southeast Missouri Redhawks are fresh legs. The Redhawks have played four straight matches that have went into overtime and six of their nine total conference games have also went into overtime. The Redhawks are only 1-2-3 in those games though. 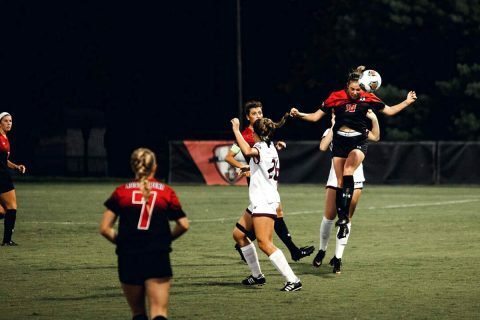 SEMO is led by Esmie Gonzalez, who has scored seven times and scored the opener in SEMO’s eventual overtime loss against Belmont on Thursday. The Govs are 6-10-2 all-time against the Redhawks and are winless in the last three meetings. After a 1-1 draw in last season’s regular season meeting, the Redhawks knocked the Govs out of the first round of the OVC Tournament.